Just over one year after its completion, Whitefish Mountain Resort's Kashmir trail has been named a model "Flow Trail" by the International Mountain Biking Association (IMBA). Once a year, IMBA recognizes outstanding mountain bike trails and locations with the IMBA Model Trail awards which encompass Epics, Ride Centers, Flow Trails and Community Bike Parks. Kashmir was one of four Flow Trails recognized, which included trails in Karnten, Austria, Sun Valley, Idaho, and the Czech Republic. The winners were announced a few weeks ago and will be recognized at the 2014 IMBA World Summit August 20-21 in Steamboat Springs, Colorado. Whitefish Mountain Resort's Events and Recreation Manager, Josh Knight will attend and accept the award. "It's an honor to see Kashmir be recognized by IMBA. As one of the first resorts in the west to provide lift-served mountain biking starting with the Summit Trail in 1996, it speaks volumes about the direction of the sport and the industry and what riders want," Knight said. "Kashmir has received many compliments over the past year from both experienced and intermediate riders progressing to the next level. Everyone involved in building the trail from our trail crew to Terraflow Trails was very proud of its creation. This award will help Whitefish continue to build on its reputation as a bicycling destination." A press release from IMBA stated, "We are confident that these awardees should go on your short list of riding destinations. These are the trails worth traveling to; the best places to introduce someone to the sport we all love and are the facilities builders and advocates should look to for inspiration." IMBA received a record number of applications, all of which were painstakingly evaluated over the course of several months by the IMBA Trail Solutions team and IMBA's region directors. Read the press release from IMBA. Riders will have the opportunity to compete on Kashmir this September in two separate events. The Double Dip Downhill is set for September 6 and 7, and will feature a course on Kashmir for Saturday's race day. On Saturday, September 13, Kashmir will play a prominent role in Whitefish Bike Park's second enduro race of the season, the Ender Enduro. Online registration is available for the Double Dip Downhill now and will be available for the Ender Enduro soon on skiwhitefish.com. The Whitefish Bike Park features nearly 30 miles of downhill and cross-country mountain bike trails. Lift-served trails are open daily mid-June to Labor Day and Friday-Sunday in September. Whitefish Bike Park's 2014 adult season pass is only $185 for unlimited lift-access and a junior or senior season pass is only $104. Single-day lift access to the Whitefish Bike Park for adults is $32 for a full day or $22 for two hours. Junior and seniors are $22 for full day and $17 for two hours. 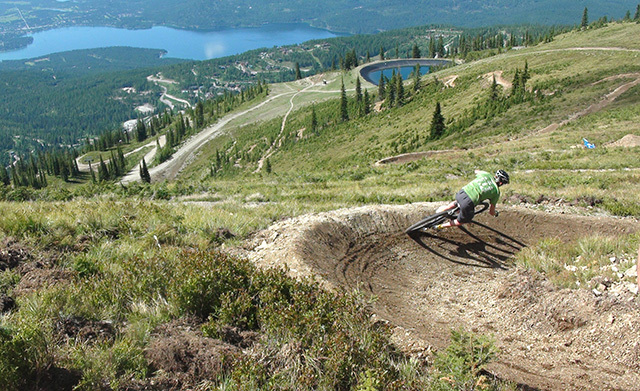 Whitefish Mountain Resort is one of the most affordable mountain biking destinations in North America. The resort's mountain biking Stay & Play Package, "Eat, Bike, Sleep, Repeat," package starts at just $70 per person, riders receive lodging at the Hibernation House, a full day bike pass and a hot breakfast to fuel the day. Rate is based on double occupancy. For more information on Whitefish Mountain Resort visit www.skiwhitefish.com. Description – Our backbone flow trail is Kashmir, running along the west ridge of the mountain toward the lower pod of downhill trails. Let the sun beat down upon your face with as much flow we can cram into it. It intersects with the Summit Trail six times so you can start small and work your way up to more advanced sections of trail.